In the last 5 years many people have been working amidst a shift in how they work digitally and where they interact digitally with colleagues. They also realize the product of their work may have shifted as well. The work product has long been presentations, white papers, spreadsheets, general reports, etc. These deliverables are products of the work done and are often only a small representation of the thinking, considerations, and actual work put in to get to the final product. This final product has long been treated by organizations as the document of record, which is the model for the systems they have been working around for years. The value of these output creations, or documents in a system of record are limited as the half life of their value is often rather short as the conditions and reality of the context they were created in and for is usually in continual flux. This means once the document is delivered not only is it (if all went well in the creation of it) correct for a relatively short period of time, but it is often just a transition point for other work. The deliverable is presented or handed over and others and then begin their work, it is just an interstitial between two or more sets of activity. Many organizations have been realizing the value in their documents that are storing, while helpful, is only a small slice of the value captured from the work that went into it. 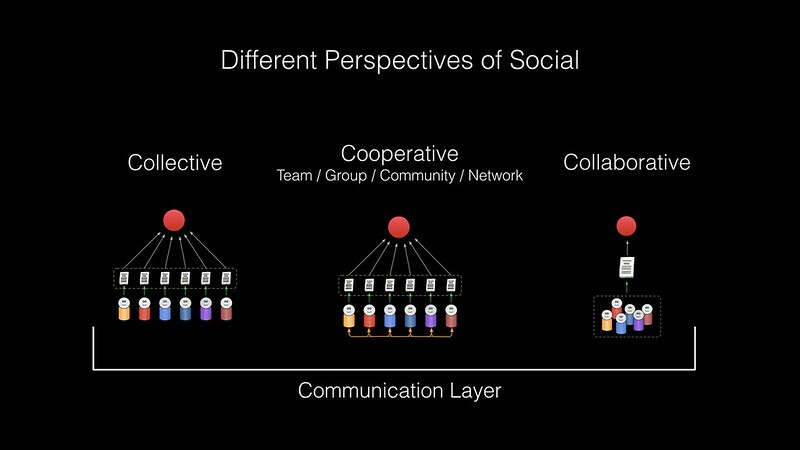 Many organizations have employees doing their work with their colleagues in collaboration / social platforms and have been using these systems of engagement to capture the work in progress. When organizations start looking at the work that is captured in these tools and in formats that are relatively easy to use, they realize the value in them far exceeds the value in the outcomes document that is tucked away in they system of record, which often are rarely returned to. What the systems of engagement offers is solid insight into the framing of the problem, the multitude of options, the researching and testing the options, thinking through the options, and often how the decisions for inclusion and exclusion were arrived upon. Much of this is captured in the service tacitly and / or explicitly. The key is to turn the tacit into explicit, or at least make it discoverable. There is a wide valley between tacit and explicit knowledge. Capturing conversation and information flows was often enough to flip the tacit to explicit for some. But, this is far from binary as it really should be easily found and addressable. One system that for many years has provided the ability to point to and annotate at a paragraph level it Traction Software, which can be and is used to annotate decision inflection points as well as information of note that can be used to highlight and annotate likely highlights for decisions. Systems of record are often the tools where outputs and outcomes are tracked. Document management and content management, Customer Relationship Management (CRM) that tracks sales and customer interactions, Enterprise Resource Planning (ERP) that tracks supply chain and product delivery, and more that are tied to business roles and / or lines of business. The systems of record are often the meta layer as the work is not done there, but the representation of that work is. The systems of engagement are the various communication, collaboration, and social business network services. The discussions, sharing of resources in and around work, and often decisions regarding what moves forward and not often happens in these services. The ability to capture the decision points and the more minor inflection points is an incredible value. But, this takes a step beyond just purely capturing it, the inflection and decisions need to be easier to find than many services offer. There are some work around solutions, which include the print a PDF of the pages / screens with inflections and decisions, then highlight and annotate the PDF and place it in the document repository. Ya, not so elegant, but it sort of works.